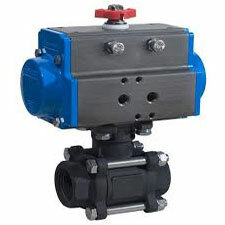 AMTECH Three piece design Ball valves can be operated by the actuator, on off type, with limit switch / with solenoid valves as per customer requirements. Valves are available made from bar stocks sand casted , investment casting in various materials, likes SS 304,SS 304L ,SS 316 ,SS 316L , IC CF8,IC CF8M,IC CF3, ICCF3M .AMTECH SINGLE PC design are regular exporting valves to Europe, America ,Asia and Gulf Countries .Sizes -1/4" to 6"(6 NB TO 150 NB). We manufacture valves from genuine guaranteed raw material with material test certificate , hydraulic test certificates , Mill TC 3.1.b available with all supply. Also , we can provide valves with third party inspection agencies.